Sweet potato is a total miracle vegetable when it comes to finding a healthier alternative to slightly more indulgent treats. There's been a real boom in sweet potato based products in supermarkets, and sweet potato sides in restaurants over the past few years from sweet potato fries, mash, crisps, brownies, caramel (yes! ), wedges and so on. My boyfriend is a huge fan of carbs things like pizza, pasta, chips, bread - you know the drill, so it can be a bit of a battle finding a happy medium when it comes to dinner time, considering I'm not at all a fan of any of those things! So sweet potato is one of those things I'm happy to settle on as a side dish when it comes to cooking our evening meals. I've always enjoyed making sweet potato fries, however my biggest gripe is that I can never get them all perfectly crispy, like you find they are in restaurants. Whether I use too much oil at times, or not enough, or have too many on the baking tray so instead of crisping up, they end up steaming - I don't know. It seems polenta is the key to getting a crispy coating, meanwhile the sweet potatoes themselves do their thang to get things all fluffy inside. I've got a packet of polenta ready and waiting in the cupboard but am yet to dabble with it. 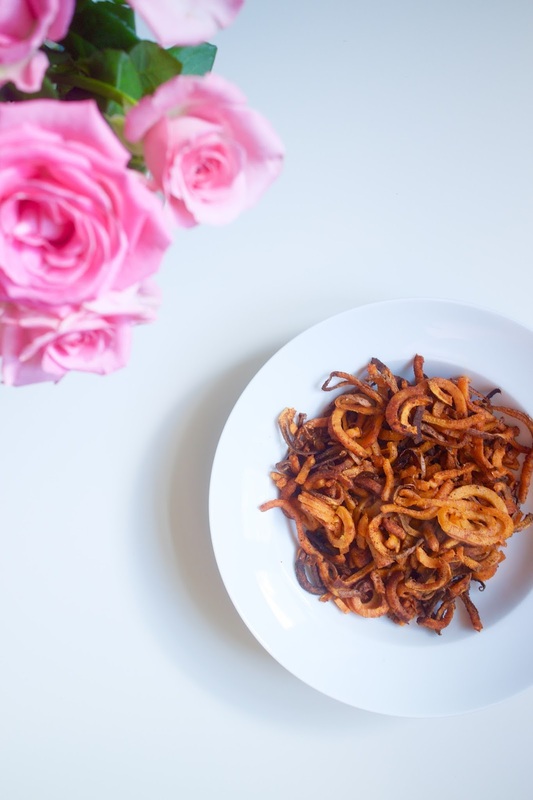 Instead, what I'm 1264829466% obsessed with are these ridiculously moreish curly, matchstick sweet potato fries! I've had my Hemsley + Hemsley spiraliser for approximately a year now but there's only so many times you can spiralise a courgette into courgetti! Of course, I'm well aware you can use a huge variety of vegetables, but only recently I figured I ought to try out sweet potato to make some curly sweet potato fries. 1. Pre heat the oven to 200C. Wash, scrub, rinse and dry your sweet potato. Chop off the ends of your sweet potato and on one side push the end of the sweet potato as centrally as possible into the blade side of the spiraliser, and push the 'grip' of the spiraliser into the other end of the sweet potato. Ensure your spiraliser is fully 'locked'. Place a baking tray underneath where the sweet potato curls will fall. 2. Ensure your hand is well gripped onto the turner, and continuously turn the handle in a clockwise motion. 3. Spread all of the sweet potato curls out onto your baking tray. Drizzle with olive oil, season with salt and pepper to taste, and sprinkle over some smoked paprika (about 1-2tsp). Toss it all together with some prongs. 4. Bake for 20-25 minutes. Every 5 minutes or so, give everything a good mix. Do this gently! Keep an eye on them for the last 5-10 minutes as they will crisp up quickly. 5. Once ready, serve up and enjoy! If you're using two sweet potatoes, spread between two baking trays. Two sweet potatoes on one baking tray will make the sweet potatoes steam and crispy, curly, matchstick sweet potato fries that does not make! This makes a great movie night snack, is delicious with panfried fish and steamed green veg, or some helium and roasted vegetable skewers with salad. Feel free to drizzle with mayonnaise, homemade aioli, avocado cream, tahini drizzle or a sprinkling of feta cheese. How do you enjoy sweet potatoes? What's your favourite healthier alternative that you and a carb loving partner/family enjoys? What's your favourite way of using your spiraliser? Any sweet potato fries tips?